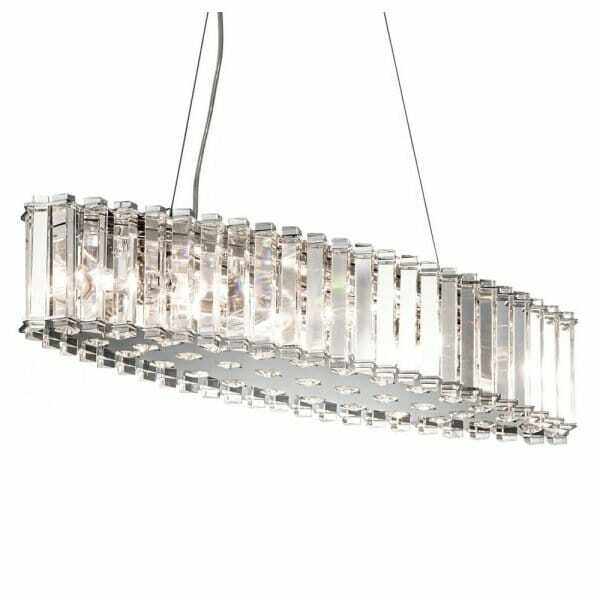 Crystal pendant light 'Crystal Skye' is best for over rectangles tables, bars and kitchen islands. A show stopper, covered in crystal cut in a triangular shape, which bounces and refracts light brilliantly. The underside too has crystals cut in a rounded prismatic shape. Crystal allows light to be split you can see colours and rainbow patterns even when daylight catches the crystal and brilliant sparkle under artificial light. It's also very energy efficient as it comes supplied with LED G9 bulbs which use only 3.5 watts each but provide around 320 lumens or about 40 standard watts. The light can be shortened at the pint of installation if required. IP44 rated for safe use in a bathroom.